Wash your jars thoroughly in hot soapy water, rinse well, then put them upside down on a tray in a very low oven (120C/gas mark ½) to dry out and warm up and sterilise. Put the blackcurrants in a pan with the lemon juice. Bring slowly to a simmer, stirring often until the fruit starts to release its juice, then simmer gently for five to 10 minutes until the fruit has collapsed. 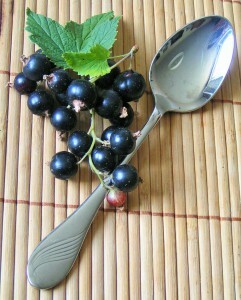 Rub through a fine sieve into a heatproof bowl to get a smooth blackcurrant puree. Add the butter and sugar to the blackcurrant puree and set the bowl over a pan of simmering water. Stir until the butter has melted and the mixture is smooth. Take off the heat and let it cool for a minute – you don’t want it to be too hot when you add the eggs, or they will scramble. It should be cool enough that you can comfortably put your finger into it. Pour in the strained beaten eggs, whisking all the while. Return the pan to the heat and stir the mixture over the simmering water until thick and creamy. This will take at least 10 minutes. It should register 82-84C on a sugar thermometer. If the curd does get too hot and start to scramble, take it off the heat and whisk vigorously until smooth. As soon as it has thickened, pour into the warm jars and seal. Leave to cool completely before labelling. Use the curd within four weeks and, once opened, keep in the fridge and use within a week.